Part of many different fandoms, pretty nerdy guy but also down to earth and very friendly. I like a variety of different things and am pretty creative. 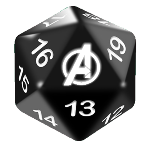 Following the style of DM of the Rings and Darths & Droids, we present a campaign comic based on The Avengers! Taking screenshots from the movies in the Marvel cinematic universe, Min-max with The Mighty Thor! Roleplay with The Incredible Hulk! Learn the rules with Captain America! Roll some criticals with Black Widow!